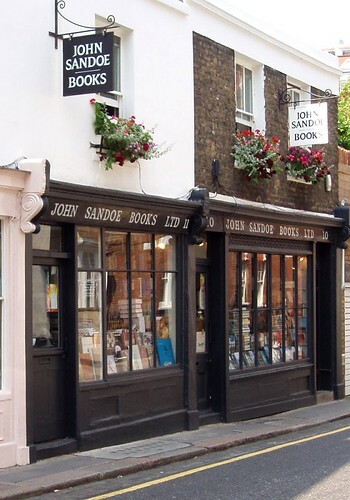 John Sandoe Books is a quaint little bookshop tucked in at 10 Blacklands Terrace off of King's Road. It is jam packed with great titles. Literally, it's stuffed to the rafters with clever, classic and interesting books. After a tasty Lebanese lunch next door at Al Dar I picked up a beautiful hardcover edition of Remembrance of Things Past. John Sandoe started this shop in 1957. Before that, these premises were partly devoted to the grooming of poodles. The other half was a junkshop, where books were sold by weight. In 1989 the shop was sold to members of staff. Since then, the business has grown and moved with the times, but it remains essentially the same - an independent literary bookshop with many regular customers. We are on three floors of an eighteenth century building. Books crammed in everywhere, up the stairs and piled on tables. No surface escapes its burden, except a few seats, and computer keyboards. And a few pathways - yes, you can get up the stairs provided you are fit. In this limited space we have about 25,000 books. Newcomers are inclined to ask if there is any system to the arrangement. (There is, but it requires experience to crack it.) It is a delight for browsers, a bibliophile's heaven.